Premier League chief executive Richard Scudamore has backed Manchester City fans who are boycotting Sunday's match at Arsenal because of the ticket price. City are reported to have returned 900 tickets of their 3,000 allocation after fans baulked at the £62 admission. "The Man City fans have done what they should do - if they think it's too much they don't turn up," Scudamore told BBC Radio 5 live's Sportsweek. "I'm absolutely sure that will be dealt with and we'll not see that again." A BBC Sport study last year revealed that Arsenal had the most expensive ticket prices, with the dearest seats costing £126 and the most expensive season ticket on sale at £1,955. The mass return of tickets by the defending Premier League champions is the highest profile instance of supporters making a protest and Scudamore admitted: "It does make people think again and that's what the market should do." Another finding from the BBC survey was that City's cheapest season ticket cost £275, which is less than the cheapest at Conference side Newport County. "There should be more affordable ticket prices at one end of the spectrum, and maybe the corporate seats and everything else get priced differently in order to afford that," Scudamore added. 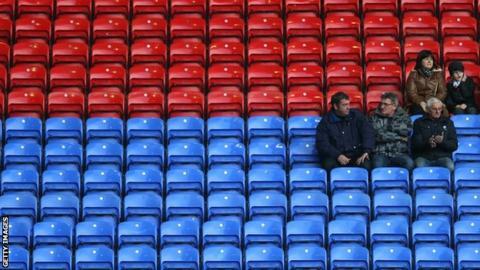 "Every club have got to make sure their ticket pricing keeps the stadiums full, that's the overriding objective. Yesterday Fulham had children in for a pound, Sunderland have got season tickets for young people at £95, there is all sorts of stuff going on around the league." Asked about the theory that working class fans are being priced out of the modern game he said: "I can't argue with the fact there has been a shift in the demographic of the audience. "If we've lost some people I accept that but we've also picked new audiences and that's been effectively the success of the league. "Clubs are pedalling awfully hard to make sure it's affordable [while] at the same time trying to meet Financial Fair Play rules. "It's a difficult challenge, they have to be able to attract players on the world market. The fans are the first to say 'we want new players,' but they've also got to break even along the fair play lines and one of the very few variables they have at their disposal is ticket prices. "It's a complex matrix no matter where you are in professional football."